You can generate a text message to be sent out to a group of families all at once, aka in a batch. Search criteria allow you to select who you want to receive the text based on family data (e.g. Family Status, Family Location, Membership Type... ) and class data (e.g. Class Location, Class Session, Primary Instructor...). The recommended texting limit is 200 texts per day, per phone number. Sending more than the recommended number of texts may result in you being considered a 'spammer' and being blocked by mobile carriers. Point to Families and click Email/Text Families. 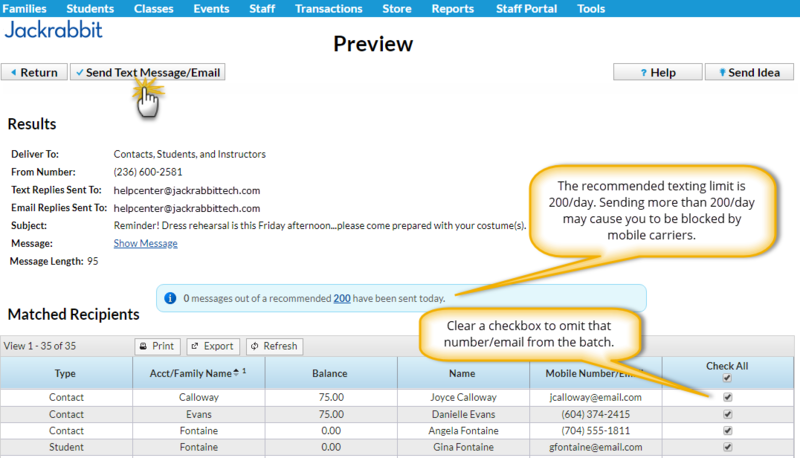 In the Type field, select Text Message/Email. Note: An email with the contents of the text will be sent to families that are opted into receiving emails but are not opted into receiving text messages. Type a Message. Your message is limited to a max of 160 characters. As you type, Jackrabbit displays the number of characters left. Use the Family/Student, Class, and Additional Search Criteria to select who you want to text. 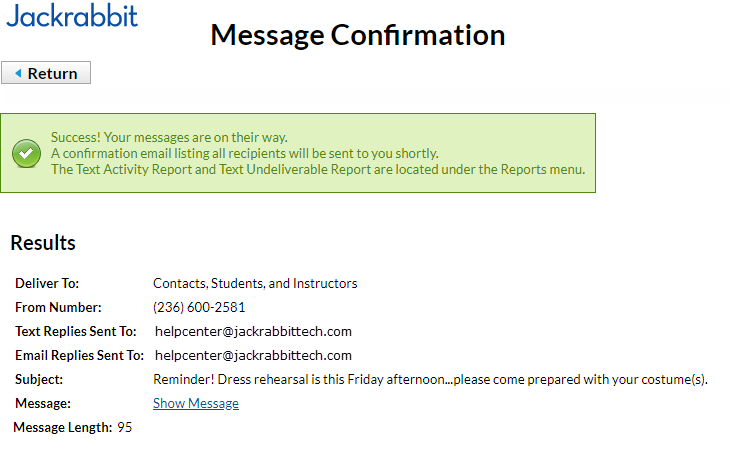 - Use Send message to to determine who the message will be sent to (contacts, students, staff, or combination of). - Optionally, set Include mass email opt-out to Yes to include anyone who may have opted out of mass emailing. This allows you to include anyone who may not have opted into texting that would receive the notification by email if they hadn't opted out. Use in cases where it is imperative to reach everyone, regardless of their opt-in status. - Use Include text opt-in to send the text message to all regardless of whether or not they have opted into texting (blank), to only those who have Already Opted-In (non-urgent), or to only those who have Not Opted-In (a great way to section out those still needing to opt-in and encourage them to sign up for texting with you). - Text replies are sent to the email address specified in Tools > Edit Settings > Text Messages > Notification Email. Use Email replies sent to to select an email address for replies to messages that were sent as emails (no mobile number or not opted-in). A review of the details of your text is offered on the left. Unchecking any name omits them from the send. If a customer meets the search criteria you used and has not opted into texting, but has opted into receiving emails, they'll be listed with their email address. They'll receive an email of the text. When you are ready to send the text messages, click Send Text Message/Email. You will receive a screen confirmation indicating that the messages are on their way. You will also receive an email confirmation with the details of the message and the recipients.